Term limits in the United States apply to many offices at both the federal and state level, and date back to the American Revolution. Term limits date back to the American Revolution, and prior to that to the democracies and republics of antiquity. The council of 500 in ancient Athens rotated its entire membership annually, as did the ephorate in ancient Sparta. The ancient Roman Republic featured a system of elected magistrates—tribunes of the plebs, aediles, quaestors, praetors, and consuls —who served a single term of one year, with re-election to the same magistracy forbidden for ten years (see cursus honorum). According to historian Garrett Fagan, office holding in the Roman Republic was based on "limited tenure of office" which ensured that "authority circulated frequently", helping to prevent corruption. An additional benefit of the cursus honorum or Run of Offices was to bring the "most experienced" politicians to the upper echelons of power-holding in the ancient republic. Many of the founders of the United States were educated in the classics, and quite familiar with rotation in office during antiquity. The debates of that day reveal a desire to study and profit from the object lessons offered by ancient democracy. Prior to independence, several colonies had already experimented with term limits. The Fundamental Orders of Connecticut of 1639, for example, prohibited the colonial governor from serving consecutive terms, setting terms at one year's length, and holding "that no person be chosen Governor above once in two years." Shortly after independence, the Pennsylvania Constitution of 1776 set maximum service in the Pennsylvania General Assembly at "four years in seven". Benjamin Franklin's influence is seen not only in that he chaired the constitutional convention which drafted the Pennsylvania constitution, but also because it included, virtually unchanged, Franklin's earlier proposals on executive rotation. Pennsylvania's plural executive was composed of twelve citizens elected for the term of three years, followed by a mandatory vacation of four years. The Articles of Confederation, adopted in 1781, established term limits for the delegates to the Continental Congress, mandating in Article V that "no person shall be capable of being a delegate for more than three years in any term of six years." On October 2, 1789, the Continental Congress appointed a committee of thirteen to examine forms of government for the impending union of the states. Among the proposals was that from the State of Virginia, written by Thomas Jefferson, urging a limitation of tenure, "to prevent every danger which might arise to American freedom by continuing too long in office the members of the Continental Congress". The committee made recommendations, which as regards congressional term limits were incorporated unchanged into the Articles of Confederation (1781–89). The fifth Article stated that "no person shall be capable of being a delegate [to the continental congress] for more than three years in any term of six years". In contrast to the Articles of Confederation, the federal constitution convention at Philadelphia omitted mandatory term limits from the U.S. Constitution of 1789. At the convention, some delegates spoke passionately against term limits such as Rufus King, who said "that he who has proved himself to be most fit for an Office, ought not to be excluded by the constitution from holding it." The Electoral College, it was believed by some delegates at the convention, could have a role to play in limiting unfit officers from continuing. When the states ratified the Constitution (1787–88), several leading statesmen regarded the lack of mandatory limits to tenure as a dangerous defect, especially, they thought, as regards the presidency and the Senate. Richard Henry Lee viewed the absence of legal limits to tenure, together with certain other features of the Constitution, as "most highly and dangerously oligarchic". Both Jefferson and George Mason advised limits on reelection to the Senate and to the Presidency, because said Mason, "nothing is so essential to the preservation of a Republican government as a periodic rotation". The historian Mercy Otis Warren, warned that "there is no provision for a rotation, nor anything to prevent the perpetuity of office in the same hands for life; which by a little well-timed bribery, will probably be done". Michael Korzi says George Washington did not set the informal precedent for a two-term limit for the Presidency. He only meant he was too worn out to personally continue in office. It was Thomas Jefferson who made it a principle in 1808. He made many statements calling for term limits in one form or another. The tradition was challenged by Ulysses Grant in 1880, and by Theodore Roosevelt in 1912. Otherwise no major effort to avoid it took place until 1940 when Franklin Roosevelt explicitly broke it. The 22nd Amendment to the U.S. Constitution was ratified in 1951 formally establishing in law the two-term limit—although it did not apply to the incumbent Harry Truman. The fact that "perpetuity in office" was not approached until the 20th century is due in part to the influence of rotation in office as a popular 19th-century concept. "Ideas are, in truth, forces", and rotation in office enjoyed such normative support, especially at the local level, that it altered political reality. For a detailed study of the 19th-century concepts of rotation, consult Political Science Quarterly, vol. 94, "House Turnover and the Principle of Rotation", by Robert Struble, Jr. See also his Treatise on Twelve Lights, chapter six, "Rotation in History". Consult also, James Young's The Washington Community, 1800–1828. According to Young, the tendency to look with mistrust upon political power was so ingrained into American culture that even the officeholders themselves perceived their occupations in a disparaging light. James Fenimore Cooper described the common view that "contact with the affairs of state is one of the most corrupting of the influences to which men are exposed". An article in the Richmond Enquirer (1822) noted that the "long cherished" principle of rotation in office had been impressed on the republican mind "by a kind of intuitive impulse, unassailable to argument or authority". Beginning about the 1830s, Jacksonian democracy introduced a less idealistic twist to the practice of limiting terms. Rotation in office came to mean taking turns in the distribution of political prizes. Rotation of nominations to the U.S. House of Representatives—the prizes—became a key element of payoffs to the party faithful. The leading lights in the local party machinery came to regard a nomination for the House as "salary" for political services rendered. A new code of political ethics evolved, based on the proposition that "turnabout is fair play". In short, rotation of nominations was intertwined with the spoils system. In district nominating conventions local leaders could negotiate and enforce agreements to pass the nominations around among themselves. Abraham Lincoln was elected to the United States House of Representatives in 1846 under such a bargain, and he returned home to Springfield after a single congressional term because, he wrote, "to enter myself as a competitor of another, or to authorize anyone so to enter me, is what my word and honor forbid". A total of 8 presidents served two full terms and declined a third and three presidents served one full term and refused a second. After World War II, however, an officeholder class had developed to the point that congressional tenure rivaled that of the U.S. Supreme Court, where tenure is for life. "Homesteading," or securing a lifelong career in Congress, was made possible by reelection rates that approached 100% by the end of the 20th century. The concept of homesteading brought about a popular movement known as the "term-limits movement". The elections of 1990–94 saw the adoption of term limits for state legislatures in almost every state where citizens had the power of the initiative. In addition, 23 states limited service in their delegation to Congress. As they pertain to Congress, these laws are no longer enforceable, however, as in 1995, the U.S. Supreme Court overturned congressional term limits in U.S. Term Limits, Inc. v. Thornton, ruling that state governments cannot limit the terms of members of the national government. Where rotation in the legislative branch has withstood court challenges, term limits continue to garner popular support. As of 2002, the advocacy group "U.S. Term Limits" found that in the 17 states where state legislators served in rotation, public support for term limits ranged from 60 to 78 percent. President Limited to being elected to a total of 2 four-year terms. A President by succession who completes more than two years of a former President's unfinished term may be elected in his or her own right only once, and 2 more four-year terms are permitted if they complete two years or less. Becoming a President by succession may happen to someone an unlimited number of times, for example, if he or she is Vice President and the President dies, resigns or is removed from office via impeachment conviction. As of 2013, term limits at the federal level are restricted to the executive branch and some agencies. Judicial appointments at the federal level are made for life, and are not subject to election or to term limits. The U.S. Congress remains (since the Thornton decision of 1995) without electoral limits. The third president, Thomas Jefferson, started the tradition of presidential term limits by refusing to run for a third term in 1808. Everything Washington did obviously set a precedent, but did not necessarily set a new policy. However, George Washington's decision in 1796 not to run for a third term has sometimes been given credit as the start of a "tradition" of the strong policy that no president should ever run for a third term. Washington wanted to retire when his first term ended in 1792 but all his advisors begged him to stand for reelection. By 1796 he insisted on retiring, for he felt worn out, and was disgusted with the virulent personal attacks on his integrity. His Farewell Address very briefly mentioned why he would not run for a third term, and goes on to give a great deal of political advice, but it does not mention term limits. After his death, his refusal to run was explained in terms of a "no-third-tradition". Historian David Crocket argues, "The argument for term limits has a solid and respectable pedigree. Contrary to popular belief, however, that pedigree does not begin with George Washington." Washington did not feel bound by a two-term limit, but he felt the stability of the republic required a contested presidential election with a choice of candidates. This would not happen if he ran again. If he won and then died, his Vice President would assume the office without having been elected, contrary to the goals of a democratic republic. (In fact, Washington did die in 1799, two years into the new term). The election went forward and he was absolutely neutral between John Adams and Thomas Jefferson. In the 1780s, about half the states provided term limits for governors. The Constitutional convention of 1787 discussed the issue and decided not to institute presidential term limits. "The matter was fairly discussed in the Convention," Washington wrote in 1788, "and to my full convictions ... I can see no propriety in precluding ourselves from the services of any man, who on some great emergency shall be deemed universally, most capable of serving the Public", even after serving two terms. The Constitution, Washington explained, retained sufficient checks against political corruption and stagnant leadership without a presidential term limits provision. Jefferson, however, strongly endorsed a policy of term limits. He rejected calls from supporters that he run for a third term in 1808, telling several state legislatures in 1807-1808 that he needed to support "the sound precedent set by [his] illustrious predecessor." In 1861, the Confederate States of America adopted a six-year term for their president and vice-president and barred the president from seeking re-election. That innovation was endorsed by many American politicians after the Civil War, most notably by Rutherford B. Hayes in his inaugural address. Ulysses Grant was urged to run for a third term in 1876, but he refused. He did try to win the 1880 nomination, but was defeated in part because of anti-third-term sentiment. Theodore Roosevelt had already served over 7 years and in 1912, after a four-year hiatus, ran for a third term. He was violently criticized; indeed, he was almost killed by John Flammang Schrank, who was obsessed with stopping a third term. Reformers during the early 1990s used the initiative and referendum to put congressional term limits on the ballot in 24 states. Voters in eight of these states approved the congressional term limits by an average electoral margin of two to one. It was an open question whether states had the constitutional authority to enact these limits. In May 1995, the U.S. Supreme Court ruled 5–4 in U.S. Term Limits, Inc. v. Thornton, 514 U.S. 779 (1995), that states cannot impose term limits upon their federal Representatives or Senators. In the 1994 elections, part of the Republican platform included legislation for term limits in Congress. After winning the majority, a Republican congressman brought a constitutional amendment to the House floor that proposed limiting members of the Senate to two six-year terms and members of the House to six two-year terms. However, this rate of rotation was so slow (the life-tenured Supreme Court averages in the vicinity of twelve years) that the congressional version of term-limits garnered little support among the populist backers of term limits, including U.S. Term Limits, the largest private organization pushing for congressional term limits. The bill got only a bare majority (227–204), falling short of the two-thirds majority (290) needed for constitutional amendments. Three other term limit amendment bills failed to get more than 200 votes. Defeated in Congress and overridden by the Supreme Court, the federal term limit movement was brought to a halt. The term limits intended simultaneously to reform state legislatures (as distinguished from the federal congressional delegations) remain in force, however, in fifteen states. In 2007 Larry J. Sabato revived the debate over term limits by arguing in A More Perfect Constitution that the success and popularity of term limits at the state level suggests that they should be adopted at the federal level as well. He specifically put forth the idea of congressional term limits and suggested a national constitutional convention be used to accomplish the amendment, since the Congress would be unlikely to propose and adopt any amendment that limits its own power. Florida Legislature (designated as POM-122 in the U.S. Senate) approved in 2012, Florida House Memorial No. 83 (see Congressional Record of July 25, 2012, at page S5378, with verbatim text provided). Taking matters a bit further, on February 10, 2016, Florida lawmakers approved House Memorial No. 417 calling upon Congress, pursuant to Article V of the Federal Constitution, to assemble a Convention to prepare a constitutional amendment that would establish term limits upon members of Congress. Legal scholars have discussed whether or not to impose term limits on the Supreme Court of the United States. Currently, Supreme Court Justices are appointed for life "during good behavior". A sentiment has developed, among certain scholars, that the Supreme Court may not be accountable in a way that is most in line with the spirit of checks and balances. Equally, scholars have argued that life tenure has taken on a new meaning in a modern context. Changes in medical care have markedly raised life expectancy and therefore has allowed Justices to serve for longer than ever before. Steven G. Calebresi and James Lindgren, professors of law at Northwestern University, argued that, because vacancies in the court are occurring with less frequency and justices served on average, between 1971 and 2006, for 26.1 years, the "efficacy of the democratic check that the appointment process provides on the Court's membership" is reduced. There have been several similar proposals to implement term limits for the nation's highest court, including Professor of Law at Duke University, Paul Carrington's 2005 "The Supreme Court Renewal Act of 2005". Many of the proposals center around a term limit for Justices that would be 18 years (Larry Sabato, Professor of Political Science at University of Virginia, suggested between 15 and 18 years). The proposed staggered term limits of 18 years would, according to Calebresi, Lindgren (2006), and Carrington (2005), allow for a new appointment to the Court every two years, which in effect would allow every president at least two appointments. Professor Carrington has argued that such a measure would not require a constitutional amendment as the "Constitution doesn’t even mention life tenure; it merely requires that justices serve during ‘good behaviour’ ". The idea was not without support among Judges, as John Roberts supported term limits before he was appointed to the Supreme Court as Chief Justice. Calebresi, Lingren, and Carrington have also proposed that when justices have served out their proposed 18-year term they should be able to sit on other Federal Courts until retirement, death, or removal. Fairleigh Dickinson University's PublicMind Poll measured American voters’ attitudes towards various proposed Supreme Court reforms, including implementing term limits. The 2010 poll found that a majority of Americans were largely unaware of a proposal to impose a term limit of 18 years, as 82% reported they had heard little or nothing at all. Notwithstanding a lack of awareness, 52% of Americans approved of limiting terms to 18 years, while 35% disapproved. When asked how old is too old for a Supreme Court judge to serve if he or she seems healthy, 48% said "no limit as long as he or she is healthy", while 31% agreed that anyone over the age of 70 is too old. In 1998, the Louisiana House of Representatives adopted House Resolution No. 120 on the subject (designated as POM-511 by the U.S. Senate and quoted in full in the Congressional Record of July 17, 1998, at page 16076). Term limits for state officials have existed since colonial times. The Pennsylvania Charter of Liberties of 1682, and the colonial frame of government of the same year, both authored by William Penn, provided for triennial rotation of the provincial council—the upper house of the colonial legislature. The Delaware Constitution of 1776 limited the governor to a single three-year term; currently, the governor of Delaware can serve two four-year terms. At present, 37 states have term limits of various types for their governors. To circumvent the term limit in Alabama incumbent governor George Wallace pushed through the nomination of his wife Lurleen, in the 1966 Democratic primary, which was, in those days, the real contest in Alabama. It was generally understood that Mrs. Wallace would only be a titular governor while her husband continued to hold the real power. She won the election, but only served 16 months before dying in 1968. As indicated above, in fifteen state legislatures the members serve in rotation, i.e., under term limits enacted during the reforms of the early 1990s. In another six states, however, state legislatures have either overturned their own limits or state supreme courts have ruled such limits unconstitutional. In 2002 the Idaho Legislature became the first legislature of its kind to repeal its own term limits, enacted by a public vote in 1994, ostensibly because it applied to local officials along with the legislature. Governors of 36 states and four territories are subject to various term limits, while the governors of 14 states, Puerto Rico, and the Mayor of Washington, D.C., may serve an unlimited number of terms. Each state's gubernatorial term limits are prescribed by its state constitution, with the exception of Wyoming, whose limits are found in its statutes. Territorial term limits are prescribed by its constitution in the Northern Mariana Islands, the Organic Acts in Guam and the U.S. Virgin Islands, and by statute in American Samoa. Unique in its restriction, Virginia prohibits its governors from serving consecutive terms, although former governors are reeligible after four years out of office. Many other states formerly had this prohibition, but all had eliminated it by 2000. The governors of the following states and territories are limited to two consecutive terms, but are reeligible after four years out of office: Alabama, Alaska, Arizona, Colorado, Florida, Georgia, Hawaii, Kansas, Kentucky, Louisiana, Maine, Maryland, Massachusetts, Nebraska, New Jersey, New Mexico, North Carolina, Ohio, Pennsylvania, Rhode Island, South Carolina, South Dakota, Tennessee, West Virginia, American Samoa, Guam, and the U.S. Virgin Islands. Equivalently, the Governors of Indiana and Oregon are limited to serving 8 out of any 12 years. Conversely, the Governors of Montana and Wyoming are limited to two terms, serving 8 out of any 16 years. 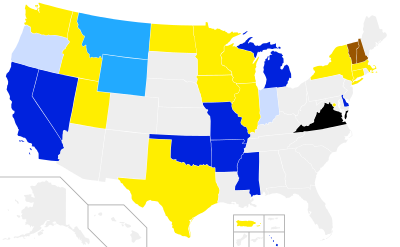 Finally, the governors of the following states and territory are limited to two terms for life: Arkansas, California, Delaware, Michigan, Mississippi, Missouri, Nevada, the Northern Mariana Islands, and Oklahoma. Former Governor of California Jerry Brown, however, served four non-consecutive terms because his first two terms were before limits were passed in California, and the limits did not apply to individuals' prior terms. The governors of New Hampshire and Vermont may serve unlimited two-year terms. The governors (or equivalent) in the following states, district, and territory may serve unlimited four-year terms: Connecticut, Idaho, Illinois, Iowa, Minnesota, New York, North Dakota, Texas, Utah, Washington, Wisconsin, District of Columbia, and Puerto Rico. The Governor of Utah was previously limited to serving three terms, but all term limit laws have since been repealed by the legislature. Arizona Legislature: four consecutive two-year terms for both houses (eight years). No limit on total number of terms. Arkansas General Assembly: sixteen years total in either the House or the Senate. (Prior to the 2014 election, the previous limits of three two-year terms for House members (six years) and two four-year terms for Senate members (eight years) applied). California State Legislature: twelve years total in either Assembly or Senate. (For legislators first elected on or before June 5, 2012, the previous limits (enacted in 1990) of either three two-year terms for Assembly members (six years) and two four-year terms for Senate members (eight years) apply). Colorado General Assembly: four consecutive two-year terms in the House (eight years) and two consecutive four-year terms in the Senate (eight years). Florida Legislature: may serve no more than eight consecutive years in either house. No limit on total number of terms. Louisiana State Legislature: three consecutive four-year terms for both houses (twelve years). Members may run for the opposite body without having to sit out an election. Michigan Legislature: three two-year terms for House members (six years) and two four-year terms for Senate members (eight years). Missouri General Assembly: four consecutive two-year terms for House members (eight years) and two four-year consecutive terms for Senate members (eight years). Members may be elected again to the other house, but not serve more than 16 years. Montana State Legislature: four two-year terms for House members (eight years) in any sixteen-year period and two four-year terms for Senate members (eight years) in any sixteen-year period. Nebraska Legislature: unicameral legislature; members limited to two consecutive four-year terms (eight years), after which they must wait four years before running again. Nevada Legislature: six two-year terms for Assembly members (twelve years) and three four-year terms for Senate members (twelve years). Ohio General Assembly: four consecutive two-year terms for House members (eight years) and two consecutive four-year terms for Senate members (eight years). Oklahoma Legislature: Twelve years of total combined service in either the House or the Senate. If a legislator's first term is the result of a special election, that service does not count toward the limit. South Dakota Legislature: four consecutive two-year terms for both houses (eight years). Idaho Legislature: the Legislature repealed its own term limits in 2002. Massachusetts General Court: the Massachusetts Supreme Judicial Court overturned term limits in 1997. Oregon Legislative Assembly: the Oregon Supreme Court ruled term limits unconstitutional in 2002. See term limits in Oregon. Utah State Legislature: the Legislature repealed its own term limits in 2003. Washington State Legislature: the Washington Supreme Court voided term limits in 1998. Wyoming Legislature: the Wyoming Supreme Court ruled term limits unconstitutional in 2004. See term limits in Wyoming. Some local governments have term limits. In Philadelphia, the mayor cannot be elected three consecutive times, but there is no limit on how long any individual can serve as mayor. Frank Rizzo was elected mayor in 1971 and 1975; he attempted to repeal the term limit, but failed and could not run in 1979. He ran unsuccessfully for the Democratic nomination for mayor in 1983 but he lost to Wilson Goode. In 1986, he switched to the Republican Party, and ran as a Republican in the mayoral elections of 1987 and 1991. Limits vary from city to city even within the same state. For example, Houston, Texas, has a limit of 2 four-year terms (prior to November 3, 2015, 3 two-year terms dating back to 1991), while San Antonio, Texas, has a limit of 4 two-year terms. Both Houston and San Antonio's term limits are absolute; elected officeholders are ineligible to run for the same position where seeking higher office is common. A two-term limit was imposed on New York City Council members and citywide elected officials (except for district attorneys) in New York City after a 1993 referendum (see the Charter of the City of New York, § 1138). On November 3, 2008, however, when Michael Bloomberg was in his second term of mayor, the City Council approved the extension of the two-term limit to a three-term limit; one year later, he was elected to a third term. The two-term limit was reinstated after a referendum in 2010. In Los Angeles the mayor serves up to two four-year terms since 1993, while the City Council serve up to three four-year terms. In Cincinnati, Ohio, the term limit for mayor is two successive four-year terms. Council members are limited to two successive four-year terms. There is no limit to total terms that may be served, just a limit on successive terms. In New Orleans, City Council members are limited to two four-year terms. However, a council member representing one of the five council districts may run for one of the two at-large seats on the council once they reach the two-term limit, and vice versa. There is no limit on the number of terms a council member may serve in a lifetime. Since 1954, the mayor of New Orleans has been limited to two consecutive four-year elected terms, but he or she may be elected again after sitting out one four-year term. When the new city plan of government was adopted, the mayor at the time, DeLesseps Story Morrison, was exempt from term limits due to a grandfather clause. Under the original Metropolitan Charter adopted in 1962, the mayor of Nashville was limited to three consecutive four-year terms, which was subsequently reduced to two consecutive four-year terms in 1991. Councilors were likewise limited to two consecutive four-year terms, but subsequent court rulings have determined the offices of district councilor and at-large councilor to be separate offices even though all councilors serve together in one unicameral body, which has meant that at large councilors have continued in office as district members, and (more frequently) district councilors have been elected to subsequent terms as at large councilors. ^ "Fundamental Orders of Connecticut". The Avalon Project: Documents in Law, History and Diplomacy. Yale Law School Lillian Goldman Law Library. Retrieved 1 May 2015. ^ Pennsylvania Constitution of 1776, section 8. ^ Pennsylvania Constitution of 1776, section 19. On Franklin's plan of 1775 see, Benjamin Franklin, The Writings of Benjamin Franklin, ed., Albert Henry Smyth, 10 vols. (New York: The Macmillan Co., 1907), 6:423, article 9. ^ "Articles of Confederation: March 1, 1781". The Avalon Project: Documents in Law, History and Diplomacy. Yale Law School Lillian Goldman Law Library. Retrieved 17 September 2015. ^ Thomas Jefferson, The Papers of Thomas Jefferson, ed. Julian F. Boyd, et al., (Princeton, N.J.: Princeton University Press, 1950–), 1:411. ^ Also, article IX, paragraph 5, of the Articles of Confederation provided that, "no person be allowed to serve in the office of president more than one year in any term of four years." ^ R.H. Lee, Letter to Edmund Randolph dated 16 October 1787, in Richard Henry Lee, The Letters of Richard Henry Lee, ed. James C. Ballagh, 2 vols. (New York: Macmillan Co., 1911), 2:450, 455. See also 1:191, letter to Edmund Pendleton dated 12 May 1776, and Letters from the Federal Farmer to the Republican, ed. Walter H. Bennett (University, Alabama: The University of Alabama Press, 1978), pp. 72–75, 86. ^ Jefferson, Papers, Boyd, ed., 12:440, 13:490. See also 15:25 for Jefferson's definition of rotation in office. ^ Mason in Jonathan Eliot, ed., The Debates in the Several State Conventions on Adoption of the Federal Constitution, 5 vols. (Washington, D.C.: Government Printing Office, 1836), 3:485. ^ Mercy Otis Warren, Observations on the new Constitution, and on the Federal and State Conventions 9, in Herbert J. Staring, ed., The Complete Anti-Federalist, 6 vols. (Chicago: University of Chicago Press, 1981) 4:270, 278. ^ Michael J. Korzi (2013). Presidential Term Limits in American History: Power, Principles, and Politics. Texas A&M UP. pp. 43–44. ^ See [https://famguardian.org/Subjects/Politics/ThomasJefferson/jeff1230.htm "Thomas Jefferson on Politics & Government". ^ Charles W. Stein, The Third-Term Tradition: Its Rise and Collapse in American Politics (1943) pp 71-116. ^ Stein, The Third-Term Tradition pp 144-222. ^ Stein, The Third-Term Tradition pp 317-340. ^ Robert Struble, Jr., "House Turnover and the Principle of Rotation Archived 2010-10-11 at the Wayback Machine," Political Science Quarterly 94 (Winter 1979–80): p. 650, and fn. 6. in the question, The quotation is from Henry James, the biographer. ^ James S. Young, The Washington Community, 1800–1828 (New York: Columbia University Press, 1966), pp. 51–52, 55–57, 59–61, 64, 145. ^ James Fenimore Cooper, The American Democrat (New York: Alfred A. Knopf, 1931), p. 52. ^ Richmond Enquirer, 8 November 1822, p. 3; Struble, supra., p. 653. ^ One can still detect the idealism of the Revolutionary period echoed by President Andrew Jackson in his address to Congress, December 8, 1829: "There are, perhaps, few men who can for any great length of time enjoy office and power without being more or less under the influence of feelings unfavorable to the faithful discharge of their public duties. Their integrity may be proof against improper considerations immediately addressed to themselves, but they are apt to acquire a habit of looking with indifference upon the public interests and of tolerating conduct from which an unpracticed man would revolt. Office is considered as a species of property, and government rather as a means of promoting individual interests than as an instrument created solely for the service of the people. Corruption in some and in others a perversion of correct feelings and principles divert government from its legitimate ends and make it an engine for the support of the few at the expense of the many."... [James D. Richardson, ed., A Compilation of the Messages and Papers of the Presidents, 10 vols. (Washington, D.C.: Government Printing Office, 1896–99), 2:448–49]. ^ Struble, supra, pp. 661–62. ^ Struble, ibid, pp. 659–60; Lincoln's letter to William Herndon, 8 January 1848, in Abraham Lincoln, The Collected Works of Abraham Lincoln, ed. Roy P. Basler, 10 vols. (New Brunswick, N.J.: Rutgers University Press, 1953), 1:430–31. ^ U.S. Term Limits, Inc. v. Thornton. The decision was 5–4. ^ Stacie Rumenap, "Career Politicians Never Did Like Term Limits," No Uncertain Terms, August 2002, vol. 10, #7, pp. 2–3. ^ Michael C. Dorf (2 August 2000). "Why the Constitution permits a Gore-Clinton ticket". CNN Interactive. ^ Scott E. Gant; Bruce G. Peabody (2006-06-13). "How to bring back Bill". Christian Science Monitor. Retrieved 2008-06-12. ^ "Transcript of the Constitution of the United States – Official Text". Archives.gov. Retrieved 2012-08-12. ^ Korzi notes it is a mistake to credit George Washington. Michael J. Korzi, Presidential Term Limits in American History: Power, Principles, and Politics (2011) p 43. ^ Susan Dunn (2013). 1940: FDR, Willkie, Lindbergh, Hitler-the Election amid the Storm. Yale UP. p. 129. ^ Michael J. Korzi, "Changing Views of Executive Tenure in Early American History," White House Studies 8#3 (2009) pp 357-379 at p 365. ^ Bruce G. Peabody, "George Washington, Presidential Term Limits, and the Problem of Reluctant Political Leadership," Presidential Studies Quarterly 31.3 (2001): 439-453, at p 442. ^ Jeremy D. Bailey (2007). Thomas Jefferson and Executive Power. p. 124. ^ Peabody 2001. p 446-48. ^ Dorothy S. Truesdale, "Rochester Views the Third Term 1880." Rochester History 2.4 (1940): pp 1-20 online. ^ Tim McNeese (2007). The Progressive Movement: Advocating Social Change. Infobase Publishing. p. 110-111. ^ Alonzo L. Hamby. Man of the People: A Life of Harry S. Truman (1995) pp 602-5. ^ Dana Priest; William Claiborne (November 9, 1994). "Voters in Several States, D.C. Adopt Limits For Legislators". The Washington Post. ^ U.S. Term Limits wanted House members to be limited to three two-year terms. ^ "H.J.Res. 73 (104th): Contract with America bill (On Passage of the Bill), House Vote #277". GovTrack.us. March 29, 1995. Retrieved November 21, 2012. ^ The four constitutional amendments on term limits which the House rejected 29 March 1995 were sponsored by: Democrat John Dingell [12/12 retroactive], rejected 135–297; Republican Bob Inglis [6/12, not retroactive], rejected 114–316; Republican Van Hilleary [12/12, unretroactive, but defers to more stringent state imposed limits], rejected 164–265; Republican Bill McCollum [12/12 not retroactive and would override more stringent state limits]; approved by less than the requisite 2/3, 227–204; on February 12, 1997 Congress did likewise by a margin of 217–211 [50.7%]. ^ "State Legislative Term Limits". US Term Limits. Retrieved November 21, 2012. ^ a b c d e Steven G. Calebresi & James Lindgren, "Term Limits for the Supreme Court: Life Tenure Reconsidered," Harvard Journal of Public Policy, Vol 29 no. 3 (2006) "Social Science Research Network. ^ a b c d e f Richard Brust, "Supreme Court 2.0, ABA Connection, (October 1, 2008). Article provides an overview of proposed reforms to the Supreme Court of the United States. ^ a b c Julie Geng, "Law Prof Proposes Supreme Court Term Limits", Cornell Sun Online (February 11, 2005). ^ Larry J. Sabato, "Reforming the Least Democratic Branch" (April 15, 1010). ^ a b c Fairleigh Dickinson University's PublicMind Poll, "Public Says Televising Court is Good for Democracy" press release (March 2010). ^ "Constitution of Virginia". Virginia Constitution. pp. Article V, §&nbsp, 1. Retrieved 28 July 2009. ^ "AMENDMENT 282 RATIFIED". Alabama Constitution. pp. Amendment 282. Retrieved 28 July 2009. ^ "Article 3 – The Executive". Alaska Constitution. pp. Article 3, §&nbsp, 5. Retrieved 28 July 2009. ^ "1. Term limits on executive department and state officers; term lengths; election; residence and office at seat of government; duties". Arizona Constitution. pp. Article 5, §&nbsp, 1 Version 2, clause A. Retrieved 28 July 2009. ^ "Section 1. Officers – terms of office". Colorado Constitution. pp. Article IV, §&nbsp, 1. Archived from the original on July 18, 2011. Retrieved 28 July 2009. ^ "The Florida Constitution". Florida Constitution. pp. Article IV, §&nbsp, 5, clause b. Retrieved 28 July 2009. ^ "Constitution of the State of Georgia" (PDF). Georgia Constitution. pp. Article V, § I, Paragraph I. Retrieved 28 July 2009. ^ "ARTICLE V". Hawaii Constitution. pp. Article V, §&nbsp, 1. Retrieved 28 July 2009. ^ "Article 1. – EXECUTIVE". Kansas Constitution. pp. Article 1, §&nbsp, 1. Retrieved 28 July 2009. ^ "Section 71". Kentucky Constitution. pp. §&nbsp, 71. Retrieved 28 July 2009. ^ "ARTICLE IV. EXECUTIVE BRANCH". Louisiana Constitution. pp. Article IV, §&nbsp, 3, Clause B. Retrieved 28 July 2009. ^ "Maine Constitution Article V. – Part First. Executive Power". Maine Constitution. pp. Article V, part 1, §&nbsp, 2. Retrieved 28 July 2009. ^ "ARTICLE II – EXECUTIVE DEPARTMENT". Maryland Constitution. pp. Article II, §&nbsp, 1. Retrieved 28 July 2009. ^ "Article IV-1". Nebraska Constitution. pp. Article IV, §&nbsp, 1. Retrieved 28 July 2009. ^ "NEW JERSEY STATE CONSTITUTION 1947". New Jersey Constitution. pp. Article V, § I, paragraph 5. Retrieved 28 July 2009. ^ "Section 1. [Composition of department; terms of office of members; residing and maintaining records at seat of government.]". New Mexico Constitution. pp. Article V, §&nbsp, 1. Retrieved 28 July 2009. ^ "ARTICLE III EXECUTIVE". North Carolina Constitution. pp. Article III, §&nbsp, 2, clause 2. Retrieved 28 July 2009. ^ "§ 3.02 Term of office". Ohio Constitution. pp. Article III, §&nbsp, 2. Retrieved 28 July 2009. ^ "CONSTITUTION OF THE COMMONWEALTH OF PENNSYLVANIA". Pennsylvania Constitution. pp. Article IV, §&nbsp, 3. Retrieved 28 July 2009. ^ "ARTICLE IV OF ELECTIONS AND CAMPAIGN FINANCE". Rhode Island Constitution. pp. Article IV, §&nbsp, 1. Retrieved 28 July 2009. ^ "ARTICLE IV. EXECUTIVE DEPARTMENT". South Carolina Constitution. pp. Article IV, §&nbsp, 3. Archived from the original on 27 April 2012. Retrieved 28 July 2009. ^ "§ 2". South Dakota Constitution. pp. Article IV, §&nbsp, 2. Retrieved 28 July 2009. ^ "Tennessee constitution – article iii. executive department". Tennessee Constitution. pp. Article III, §&nbsp, 4. Retrieved 28 July 2009. ^ "Constitution of West Virginia". West Virginia Constitution. pp. Article VII, §&nbsp, 4. Retrieved 28 July 2009. ^ "Title 4 EXECUTIVE". American Samoa Code. pp. §&nbsp, 4.0107. Archived from the original on May 17, 2008. Retrieved 28 July 2009. ^ "§ 1422. Governor and Lieutenant Governor; term of office; qualifications; powers and duties; annual report to Congress". United States Code. pp. Title 48, §&nbsp, 1422. Retrieved 28 July 2009. ^ "§ 1591. Governor and Lieutenant Governor; election; eligibility; official residence; powers and duties; report". United States Code. pp. Title 48, §&nbsp, 1591. Retrieved 28 July 2009. ^ "ARTICLE 5". Indiana Constitution. pp. Article V, §&nbsp, 1. Retrieved 28 July 2009. ^ "Constitution of Oregon". Oregon Constitution. pp. Article V, §&nbsp, 1. Archived from the original on 5 February 2007. Retrieved 28 July 2009. ^ "Montana Constitution". pp. Article IV, §&nbsp, 8. Retrieved 11 December 2011. ^ "CHAPTER 5 – NOMINATIONS". Wyoming Statutes. pp. §&nbsp, 22–5–103. Retrieved 28 July 2009. ^ "Amend. 73. Arkansas Term Limitation Amendment" (PDF). Arkansas Constitution. p. 134. Retrieved 11 December 2011. ^ "CALIFORNIA CONSTITUTION ARTICLE 5 EXECUTIVE". California Constitution. pp. Article 5, §&nbsp, 2. Archived from the original on 8 January 2011. Retrieved 28 July 2009. ^ "ARTICLE. III EXECUTIVE". Delaware Constitution. pp. Article III, §&nbsp, 5. Retrieved 28 July 2009. ^ "Michigan Constitution" (PDF). pp. Article V, §&nbsp, 30. Retrieved 28 July 2009. ^ "THE CONSTITUTION OF THE STATE OF MISSISSIPPI". Mississippi Constitution. pp. Article 5, §&nbsp, 116. Retrieved 28 July 2009. ^ "Article IV EXECUTIVE DEPARTMENT Section 17". Missouri Constitution. pp. Article IV, §&nbsp, 17. Retrieved 28 July 2009. ^ "THE CONSTITUTION OF THE STATE OF NEVADA". Nevada Constitution. pp. Article 5, §&nbsp, 3. Retrieved 28 July 2009. ^ "ARTICLE III: EXECUTIVE BRANCH". Northern Mariana Islands Constitution. pp. Article III, §&nbsp, 4. Retrieved 28 July 2009. ^ "SECTION VI-4 Terms of office – Succession" (RTF). Oklahoma Constitution. pp. Article VI, §&nbsp, 4. Retrieved 5 January 2015. ^ "Illinois General Assembly - Bill Status for SR0003". www.ilga.gov. Retrieved 2019-02-11. ^ "Frequently Asked Questions About Senators". Archived 2014-07-01 at the Wayback Machine Nebraska Legislature. Retrieved 27 May 2015. Archived 2 April 2015 at Wayback Machine. ^ "Term limits will land on city ballot in Nov". New York Post. 12 August 2010. ^ Hernandez, Javier C. (3 November 2010). "Term Limits in New York City Are Approved Again". The New York Times. Crockett, David A. "'An Excess of Refinement]: Lame Duck Presidents in Constitutional and Historical Context " Presidential Studies Quarterly (2008) 38#4 pp. 707-21. Korzi, Michael J. "Changing Views of Executive Tenure in Early American History," White House Studies 8#3 (2009) pp 357-379. Korzi, Michael J. (2013). Presidential Term Limits in American History: Power, Principles, and Politics. Texas A&M UP. O'Keefe, Eric (2008). "Term Limits". In Hamowy, Ronald (ed.). The Encyclopedia of Libertarianism. The Encyclopedia of Libertarianism. Thousand Oaks, CA: SAGE; Cato Institute. pp. 504–06. doi:10.4135/9781412965811.n308. ISBN 978-1-4129-6580-4. LCCN 2008009151. OCLC 750831024. Peabody, Bruce G. "George Washington, presidential term limits, and the problem of reluctant political leadership." Presidential Studies Quarterly 31.3 (2001): 439-453. Sigel, Roberta S., and David J. Butler. "The Public and the No Third Term Tradition: Inquiry into Attitudes Toward Power." Midwest Journal of Political Science 8.1 (1964): 39-54. Stathis, Stephen W. "The Twenty-Second Amendment: A practical remedy or partisan maneuver." Constitutional Commentary 7 (1990): 61+.